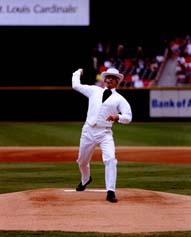 Me as The Re-Mark-able Twain throwing the first pitch out at a St. Louis Cardinal's Baseball game. I've been performing in some capacity every since I was a kid in third grade singing solos in music class. Unfortunately, my voice has changed and I don't sing anymore but I've continued to carry the performer's spirit in my soul. Over the course of my life I've acted in many venues and in many roles. I've done comedy, magic, game show hosting, public speaking and I even developed a one man impersonation show of one of the world's greatest writers and humorist, Mark Twain that has taken me to corporate events across the country and even into the Bahamas. In between actually doing all the gigs, I also co-owned a corporate entertainment company that booked entertainers all over the world, which allowed me to travel and meet some famous and interesting people. I also managed The Funnybone Comedy Club in St. Louis, MO.